I could go with any size, but the largest would be best - we have 4 kids, so we're looking to grow as much as we can. This would be great for us because the best location to grow anything sun-wise on our property is covered with sand/gravel. I would like to win the 50"x12" to grow tomatos and squash and cucumbers. I would love the Original size and would grow my lettuce, tomatoes and hot peppers in it. It would be great for my deck so I don't have to worry about any rabbits getting in it and helping themselves to my lettuce, lol. I would love the Original bag! The bigger the better for this garden loving Texas chick mother of 3! I plan to use it for my tomatoes and green peppers! I'd like the original, and we'd grow tomatoes and beans in it. I would love to grow some spagghetti squash in on of these . I buy those all the time and this would save me money.Thanks for the chance! I would love the large because squash plants spread out.Thanks for the chance. I would love the original bag so I could grow lots of vegetables like onions, lettuce, peppers and tomatoes. would love the original for tomatoes! I need the original size bed. There are lots of things I want to grow in it, where I lived before in PA I had 2 very large gardens and now in TN where it's hard clay dirt I'm having a hard time growing things, I tried tomatoes and that didn't work I tried string beans because string beans always grow - well they don't! In PA I would freeze 15 gallons of string beans for the winter and now having to buy them in the store kills me. I would grow string beans, cucumbers, green peppers, beefsteak tomatoes, cherry tomatoes, one zucchini plant and some lettuce to start I'd love to see if I could actually do this here and make it work I've never "bed" gardened before. I love this giveaway! 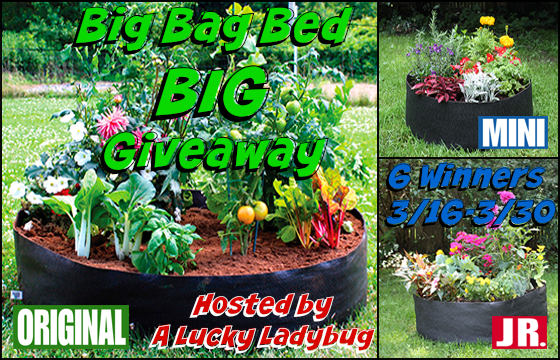 I need the original Big Bag Bed because I can use it for a nice garden in my backyard. I would love the original. I would plant tomatoes, squash, and no telling what else in it. I would choose the Original size and would love to start growing mint, basil, scallions and tomatoes. I would love to fulfill my dream of planting & growing a lemon tree too! I would love the original size! I want to plant a few cute flowers and then I would like to plant some peppers, and herbs like basil, thyme, cilantro etc. this would be great to do!! The original would be perfect for growing watermelon! The yard floods and 2 years in a row my melons got killed by drowning this would raise them enough to survive! The original would be perfect for us! Our old house had a great gardening spot but we are on a hill in our new home. There's no great spot for a regular garden. I think a Big Bag Bed would work perfectly! I would use the original to add veggie plants to my gardening . I would love Jr size. I'm just starting a garden but would love to grow strawberries! I would love the original. I would reallylike to grow tomatoes, cucumbers, green beans and green peppers. What a neat idea!! Love it! I need the Big Bag so I can turn my tiny back yard into a garden and due to my injury, I need the raised bed so I can sit while working in my garden. I Would Love The Original,I want to plant Tomatoes,Bell Peppers. Green Beans If I Have Room. The biggest one possible please! Tomatoes and peppers for me. The original would be perfect,I would grow organic lettuce,tomato,carrots,and herbs to make an organic salad. Would love the original size for planting veggies and herbs..Would love to try garlic this year and this would be the perfect size. I'd like the Original. I'd plant tomatoes of course, watermelon, cucumber, and maybe cantaloupe. I'd love the original size and we'd grow lots of peppers in it. My husband is always wanting to try new garden methods. I would like "The Original" size. The bigger the better. I like to plant a big variety of veggies such as Cabbage, Carrots, Cukes, Onions, Peppers, Broccoli, Swiss Chard and more! This would be fabulous. I would like the original size to grow a kitchen garden. My husband is an AMAZING cook. I think the mini would be a perfect size. I would try a variety of vegetables and maybe alternate the next year with flowers. Would use the original size for carrots and onions. I would want the Original size for my garden, And I would plant Veggies, Lettuce, cucumbers, beefsteak tomatoes, green peppers, zucchini's, and carrots.. Yum, I can taste the delicious fresh salads already. I like the original and would grow tomatoes. We would love an original size Big Bag Bed to grow tomatoes, various varieties of peppers, and some herbs !